It's been a busy couple of weeks as the shop comes together. Though we're still making and creating every day, most activity centers around big-scale projects like countertops and shelving units. As the shop-building process rolled on, I found myself needing something smaller scale and more familiar to sooth my soul. The obvious solution: lotion. Lotion is a great project for your maker fix. It's quick, easy, and the gratification is nearly immediate. No sitting around and waiting to unmold something a day or three later, or to ferment for a number of weeks, or to cure who knows what for who knows how long. Nope. Make your lotion, give it a test drive, and you're good. Beauty & Wellness, Blog, Crafty! It's wintertime and windy, and this means chapped lips for a lot of us. Lips are somewhere one would think you wouldn't want to be putting products with unrecognizable names or odd ingredients, but we often do just that with our standard Blistex, Chapstick, or whatever moisturizer of choice you have in mind. It doesn't have to be that way, however. 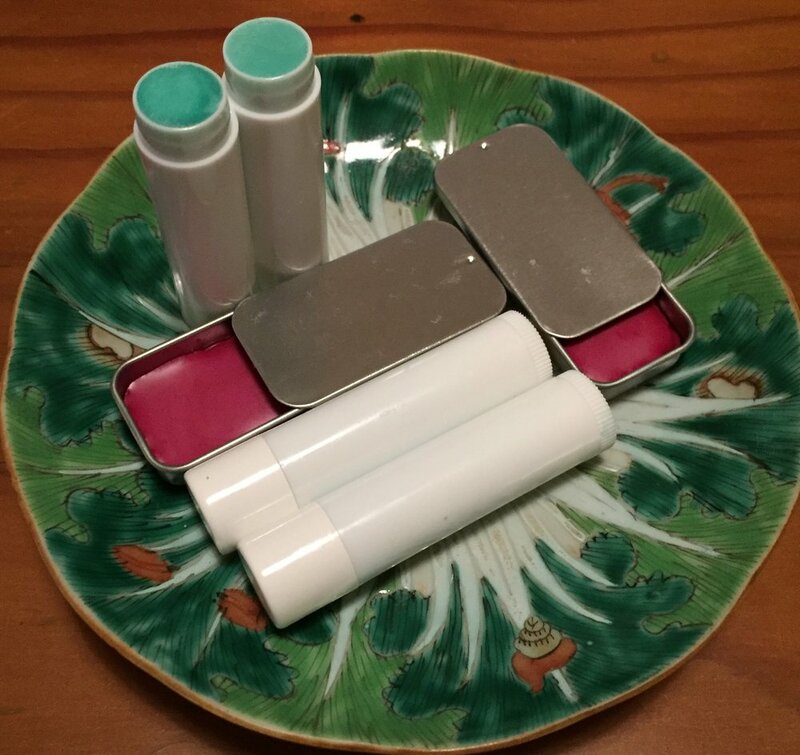 Lip balm is really easy to make using simple ingredients, and it is lots of fun, too. In fact, we already had all of the basic ingredients already on-hand, what was crucial was the tubes. Once we got that straightened out, and then we picked up a filler tray a few weeks ago, it became obvious that a massive batch of lip balm was needed. Best be prepared for the colder temps! We used the standard recipe from Soap Queen TV, mostly because um... yum BUTTERCREAM, but there are other great recipes out there, including Imitation Burt's Bees from Wellness Mama and the really fun alternatives proposed in 20 Deliciously Simple DIY Recipes from B+C. Whatever recipe you choose, essentially you'll want to have coconut oil, beeswax, and then some other variety of oils to work with for your balm. If you're going for a completely natural option, you can stop there, but we went the whole nine yards with adding color and fragrance. The first batch was our sample batch and the colorant was way more potent than expected. Not to worry! What was going to be a lip balm turned quickly into a lip tint, and honestly, it turned out even better as a result. However, 50 tubes of lip tint was more than we needed, so we were far more conservative with our color once we got to the larger batch. In fact, this is why one makes a test batch first; we patted ourselves on the back for learning our lesson on the small-scale attempt. We also learned the power of the disposable dropper during this experiment, as the lip balm hardens quickly and got completely stuck in the dropper after a point. In other words, it is reasonable to assume that after doing this project, you won't be getting your dropper back, and it's best to be ok with parting ways from the outset. The tube tray was a new adventure and honestly delightful! In the same amount of time it took to make one tube, we made 50, so that felt pretty good. We lost a few tubes to a hasty dismount once the lip balm was dry and ready, mucking up the top layer of the balm within the tube. This was essentially just an esthetic problem, so it just meant more freebies for us. Again, winning. It was also important to have a cookie sheet beneath the tray, as part of the task of getting the balm into the tubes required jiggling the tray a bit, and spilling was inevitable. All total, the project took less than an hour. We had a little bit of lip balm left over from the tray (and onto the cookie sheet), so we mixed it with some milk melt & pour soap base to create a soft creamy soap. It smells delightful, too! Part of the beauty of working with ingredients you can name is that you know when you can use them elsewhere, as well! Win-win. Toilets are gross. That is fact. As a mom to four children - three of them boys - I feel I spend too much energy trying to find ways to keep the toilet as not-gross as possible. Enter: the toilet fizzy, aka the toilet freshener. I wish there were a better term for these things because they are cute and adorable and everything toilet bowls are not. But, it seems we need to have the word toilet in the item name, so any notion of something cute or adorable basically goes down the drain (har, har). These fizzies were super easy to make, and they work! Think of them as a bath bomb for your toilet, leaving your toilet sparkling and new with more excitement and less effort than scouring powder. WIN. We borrowed our recipe from the ever-awesome Soap Queen, as we had most of the ingredients on-hand from a previous Brambleberry purchase. The toilet fresheners are made of the same common ingredients found in bath bombs: sodium bicarbonate, citric acid, and witch hazel. We followed their lead and used lemon and peppermint essential oils, as it seemed a mighty fine combo for a toilet, but ultimately it's up to you. This recipe is heavy on essential oils, so you probably don't want to use your very pricey options. You also want to use a combo that you are happy to let overpower your prep space for a spell. Lemon and peppermint were delightful choices, but I could see this being very effective with other citrus options such as grapefruit or orange, as well. Also optional is the flower-y mold recommended in the recipe, as really you just need a small enough mold to fit the purpose. That said, flowers are pretty. The process was very similar to making a bath bomb: combine citric acid and sodium bicarbonate, break up clumps, and add essential oils. Test the combined mixture to see if it's about the consistency of wet sand (it should hold its shape if you squeeze it in your hands); if it needs some moisture, spritz it with some witch hazel. Be careful not to spray on too much, or you could set the fizzy tablet a-fizzin! Ask me how I know. Once you have the right consistency, you place the mixture into the mold and allow it to sit. We checked on our fizzies two or three hours later and they seemed good to go. Soap Queen recommended "a few hours" or overnight, as this timing may depend on your location. My six-year-old wanted to take on the challenge of using a toilet freshener for the first time, and this was a sign to me that we needed to keep these on-hand at all times. We popped one into the toilet and the whole space filled with a nice peppermint-lemon smell; I gave it a swish after the fizzing stopped and the toilet was minty fresh new. If anything, the fizzles will inspire me to do this process on a regular basis, and will make cleaning the toilet just a touch more enjoyable than usual. It's been lots of fun exploring kombucha brewing. We're not big soda drinkers but love our fizzy water; kombucha does a nice job of filling a space somewhere between the two. And, of course, kombucha fans know that it's a healthy alternative, packed with probiotics that boost your immune system and improve gut health. Time will tell if a daily dose of kombucha keeps the pounds at bay, because we're hooked. Pictured here is our first batch of kombucha ever made, with a combination of pom-ginger and lemon-ginger bottles. We dove right into our second batch of brewing immediately afterward, starting up our scoby hotel that very day. One thing is for certain: Frigg's never does things halfway. Book a Make + Take event or party!